was held on March 5th 2019. The winning team, Airyhall Primary School, Aberdeen are pictured with their trophy. 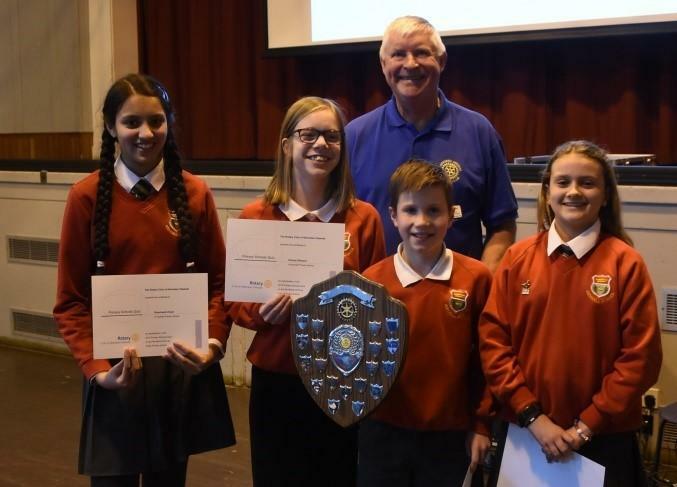 Five local Primary Schools in the Aberdeen Deeside area battled it out to go through to the next round of the Rotary Primary Schools Quiz competition. Teams of 4 pupils each tackled 60 questions, 6 questions per round, on a range of topics- Alphabet, Natural World, History, Human Body, Geography, Mathematics, Literature, Technology, Sport, Media. The winning team Airyhall primary will now go on to compete in the Area heat of the Rotary District 1010 Competition to be held on Saturday 28th April hosted by Rotary Club of Stonehaven. The Rotary Club of Aberdeen Deeside Youth and Vocational team sponsor this event annually. Deeside Rotarians who assisted had great fun at the event. The Aberdeen Deeside Rotary club raises funds for local, national and international projects and if you feel you would like to help them you can contact the club via the Contact Us button above.